Next to my bed, there is a green construction paper box, loosely taped together by my daughters. This past week, they have been getting up at the crack of dawn, waving flashlights around my dark bedroom (and in my face) and placing homemade Valentines into my box. Lily and Emmy get so excited about Valentine’s Day. I always loved Valentine’s Day when I was little, too. Passing out Valentines to all my classmates and getting them in return was so much fun. The cards would be simple, with maybe a piece of chocolate or a stick of gum taped on to the envelope. One year, when I was about 9 or 10 years old, I missed the Valentine’s Day party at school. I was so miserable. I had itchy spots all over and had to take oatmeal baths. A classmate had given me chicken pox. My grandparents made sure I still had a Valentine that year. They sent me a big red plastic heart filled with M&M’s. I remember sneaking some of those little bits of deliciousness when my mom was doing laundry. I still love getting chocolate on Valentine’s Day, but I don’t really need the chocolate. What I want is a nice dinner out with just Ed and me. Since my birthday is at the beginning of February, we went out for a steak dinner last weekend for my birthday and Valentine’s Day. It was a very fancy restaurant called Fleming’s, a once-a-year-or-maybe-even-less type of restaurant. I knew when the wait staff offered me a black napkin that I was out of my league. I’ve never been offered a black napkin before. Why a black napkin? I was wearing black pants and a white napkin would leave unsightly lint on my black attire. When the waitress offered me a dessert wine for twenty-four dollars a glass, Ed jokingly told me I’d better not order it. I did splurge with my dinner order, however. After all, a good steak was the reason we were there. I had a center cut porcini rubbed filet Mignon with grilled high country asparagus spears and gorgonzola cream sauce. Ed splurged on a filet topped with Alaskan King Crab. We did end the meal with chocolate…chocolate lava cake! Instead of a romantic night out tonight, Ed and I will snuggle on the couch with our two little Valentines, eating pizza and watching a movie. The girls will probably have sneaked too many chocolate candies and will go to bed with sugary dreams. I may just sneak a couple of chocolates myself. Link up your Valentine’s Day posts here! Then come back on Monday. Gretchen at Second Blooming and I will give you next week’s prompt. That dinner sounds great. I’ve only gotten the black napkin treatment once myself. Like you, I didn’t realize what it was for at first either. A friend had to explain it to me. Hope you had a wonderful Valentine’s Day! Love those little handmade cards from the kids! 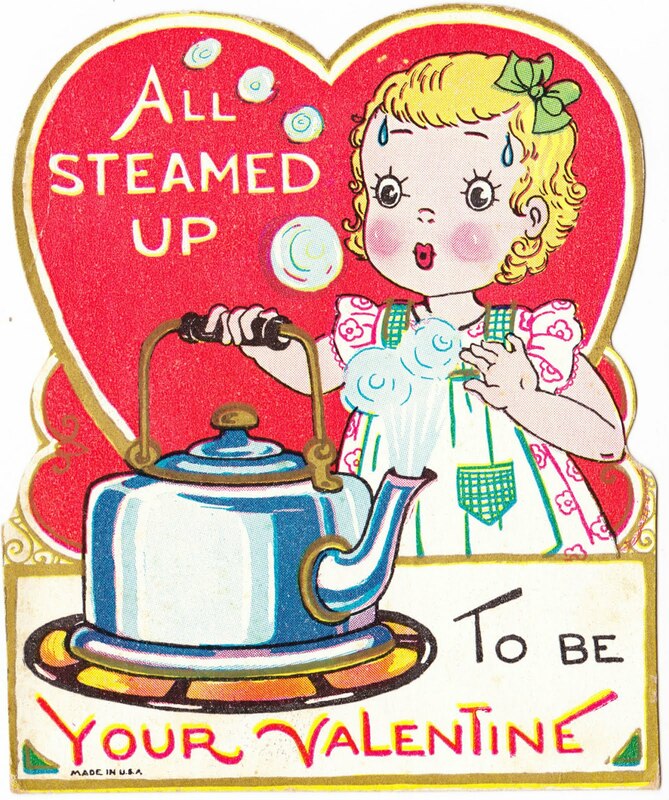 I’m loving your vintage valentines. Something about the graphics, colours, and words that are completely great. Thanks for hosting the V-day linkup. Nothing wrong with a little snuggle time on the couch with the one you love. Sounds perfect and heavenly to me! That sounds like the perfect Valentine’s Day celebration. Hallmark can keep their overpriced cards and images of flowers. Love it! Sharon, The Mayor of Crazyville recently posted…Boycotting V-Day – Hmm, Really? That was a great Spin! We stayed home too. My boys had their girlfriends over and we all hung out. My youngest’s girlfriend even made all of us some mocha chocolate cupcake from scratch. Dinner out would have been crazy. Sounds like the PERFECT Valentine’s to me! Have a happy, snuggly night! Happy Valentine’s Day my friend! Happy Birthday and Happy Valentine’s Day! 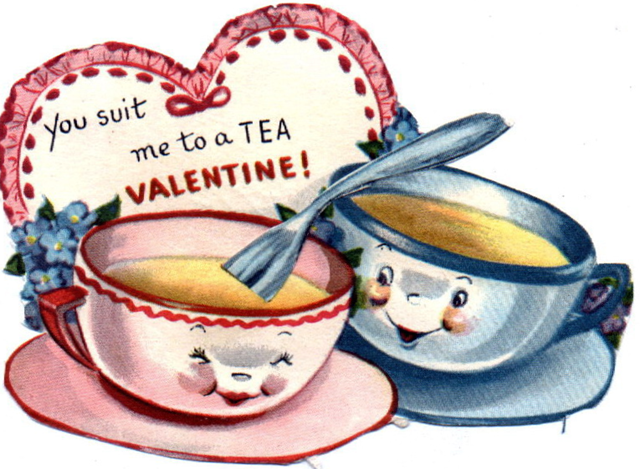 I remember being sick on many a Valentine’s Day as a kid. It will always be so special to me. tamaralikecamera recently posted…Random Acts of Kind Ask Away Fridays. Janine Huldie recently posted…A Hair Cut, Good Friends, And A Bottle of Wine, Too!